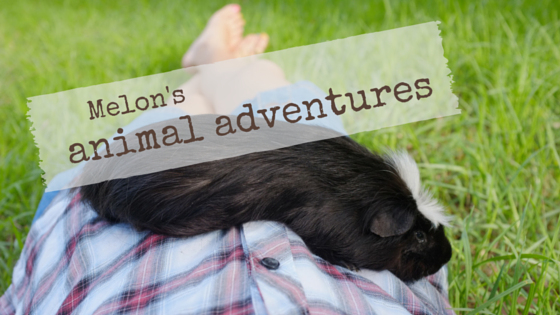 Melon's Animal Adventures: Starting to feel my age? So you guys know that I'm pretty old for a guinea pig... and most of the time I seem to be still going strong. But recently I've been losing weight, and a couple weeks ago I got rushed to the hospital for what my hoomans thought were seizures, although they now think it was actually due to me being very itchy, overbalancing when scratching and then having to jerk violently to get back on my feet again. Now, I haven't been doing those itchy-scratchy-flipping things much anymore, and I've never seen so much food in my life, but I'm still losing a fair amount of weight. So I went to the v-e-t to get blood taken today. Now, they told my hoomans that I was sedated to steal my blood, but I'm not sure about that 'cause I sure felt bouncy when they came to pick me up! Results soon. If they don't find anything, I might have to have an operation to grind my teeth down! Okay, so I've had that before... but my hoomans want to avoid that if possible. They say that it might be tough for a senior guy like me. So if you have some to spare, Melon says we would really appreciate some POTP here.